Spotted at the new Aga Khan Museum and Cultural Centre at Don Mills and Eglinton in Toronto. She sits on the fence closest to the off ramp on the Con Valley Expressway and is eating rodents (field mice) as they are plentiful. Successfully took great close ups with an iphone as she let me get several feet away from her. Loud noises and people didn't even bother her. She can be found daily sitting on the fence waiting for her meal to show up. She even poses for the camera. 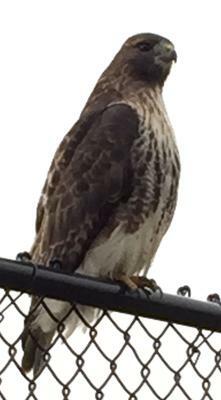 Thank you for sending your report and this splendid picture of the hawk!